Coauthored by George Stegeman, one of the most highly respected pioneers of nonlinear optics—with contributions on applications from Robert Stegeman—this book covers nonlinear optics from a combined physics, optics, materials science, and devices perspective. It offers a thoroughly balanced treatment of concepts, nonlinear materials, practical aspects of nonlinear devices, and current application areas. 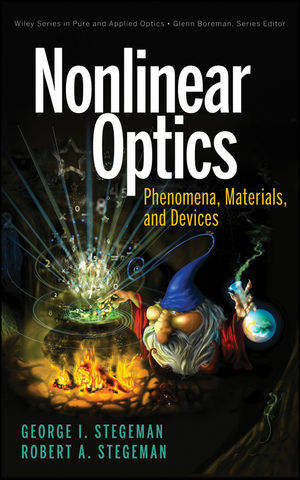 Based on more than twenty years of lectures at the College of Optics and Photonics (CREOL) at the University of Central Florida, Nonlinear Optics introduces all topics from the ground up, making the material easily accessible not only for physicists, but also for chemists and materials scientists, as well as professionals in diverse areas of optics, from laser physics to electrical engineering. GEORGE I. STEGEMAN, PhD, is Chair Professor in the College of Engineering at KFUPM, Saudi Arabia, and Emeritus Professor at the College of Optics and Photonics (CREOL) of the University of Central Florida (UCF). He is the first recipient of the Cobb Family Eminent Chair in Optical Sciences and Engineering at UCF. Dr. Stegeman is a Fellow of the Optical Society of America and has received the Canadian Association of Physicists's Herzberg Medal for achievement in physics and the Optical Society of America's R.W. Wood Prize. ROBERT A. STEGEMAN, PhD, has held professional positions at the College of Optical Sciences at The University of Arizona, as well as various industrial companies.